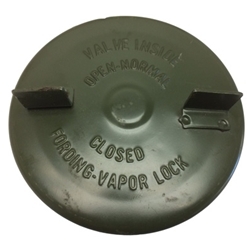 Cap, Fuel, 4 5/8, with chain and clip. These are high quality reproduction caps. We replace the rubber seal with our own production seal which can handle modern fuels. Cap, Fuel, 4 5/8, with chain and clip. These are correct for all pre A2 jeeps.